Registry Repair v5. © Glarysoft Ltd. Registry Repair is a free registry cleaner from Glarysoft, the company that also produces the file recovery software Glary Undelete and the file search tool called Quick Search. Registry Repair is great because it creates registry backups automatically before removing any issues. This review is of Registry Repair version 5.0.1.102, which was released on January 28, 2019. Please let me know if there's a newer version I need to review. 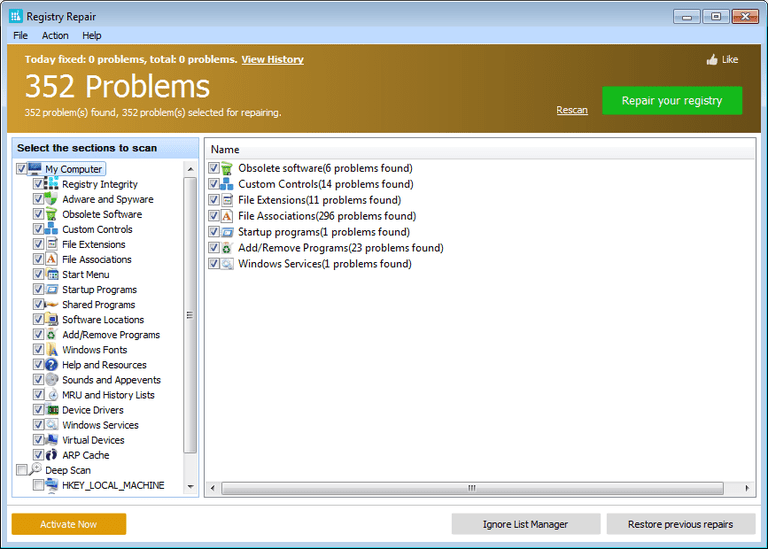 Registry Repair's program interface isn't cluttered with unnecessary tools, which is good because it makes cleaning the registry very simple. I've noticed that this program scans my computer just as fast as similar registry cleaners, but it does clean the errors a bit quicker. Something I wish Registry Repair did for free is schedule repairs. Fortunately, Wise Registry Cleaner, another free reg cleaner, does just that. So if that's something you're after, check out that program. After the installation of Registry Repair, you're asked if you'd like to run the program (this is typical) but you may also be asked if you'd like to install other programs from Glarysoft. Be sure to uncheck them if you're not interested.